The number of special deductions, credits, and other tax preferences provided to businesses in the Internal Revenue Code has expanded significantly since the last comprehensive tax reform effort nearly three decades ago. Such tax preferences help well-connected special interests, but do little for economic growth. To be successful in an increasingly competitive global economy, the Nation cannot afford to maintain a tax code burdened with such tax breaks; instead, the tax code needs to ensure that the United States is the most attractive place for entrepreneurship and business growth. Therefore, in the Budget, the President is calling on the Congress to immediately begin work on business tax reform that achieves the following five goals: (1) cut the corporate tax rate and pay for it by making structural reforms and eliminating loopholes and subsidies; (2) strengthen American manufacturing and innovation; (3) strengthen the international tax system; (4) simplify and cut taxes for small businesses; and (5) avoid adding to deficits in the short-term or the long-term. Consistent with these goals, the Budget includes a detailed set of business proposals that close loopholes and provide incentives for growth in a fiscally responsible manner. The Administration proposes that these policies be enacted as part of business tax reform that is revenue neutral over the long run. As a result, the net savings from these proposals, which are described below, are not reflected in the budget estimates of receipts and are generally not counted toward meeting the Administration’s deficit reduction goals. However, as part of transitioning to a reformed international tax system, the President’s plan would impose a one-time transition toll charge of 14 percent on the $1 to $2 trillion of untaxed foreign earnings that U.S. companies have accumulated overseas. The Budget proposes to use the one-time savings from this toll charge to pay for investment in transportation infrastructure. Certainly, a substantial number of Republicans in Congress would be in agreement that the corporate tax code is too full of "special deductions, credits, and other tax preferences," and that a revenue-neutral tax reform to simplify the tax code and bring down tax rates is a worthy goal. The problems arise when you start digging into the details. Table 12-3 in the chapter lists about 67 provisions of the corporate income tax that the Obama Administration proposes altering for this grand trade-off. 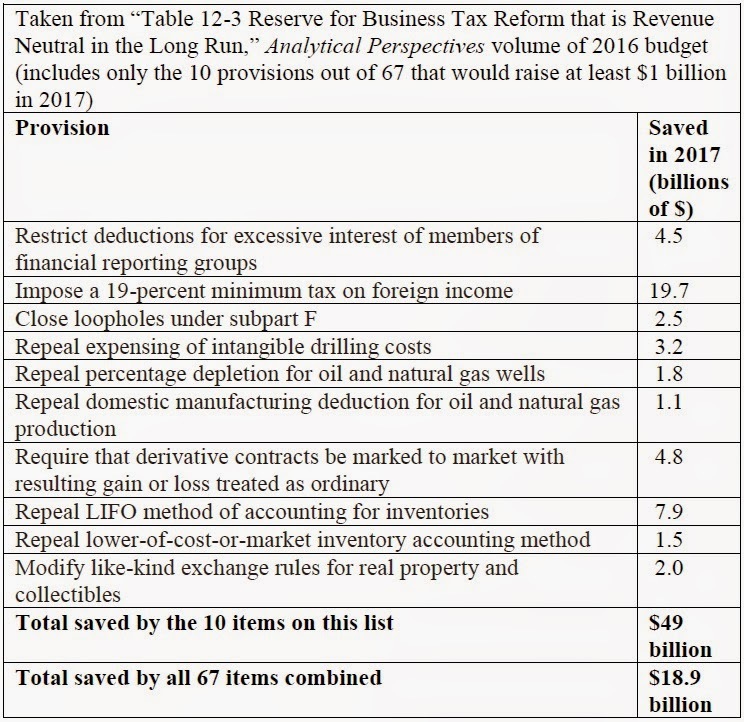 I've created a table of the 10 provisions that would increase federal revenue by more than $1 billion in 2017 (some of the provisions take a year or two to phase in). This list of corporate tax revenue-raisers, waiting to be traded off for lower rates and tax simplification, raises several questions. 1) As you can see, adding up the 10 provisions in the table would raise an estimated $49 billion in revenue. However, the total revenue raised by all 67 provisions in the table is only $18.9 billion. This arises because many items in the table do not increase tax revenue, but instead spend it. For example, there is $13.5 billion in 2017 in extra tax breaks for various provisions under the category of "Simplification and tax relief for small business." There is another $11.7 billion for various tax breaks under heading of "Incentives for manufacturing, research, and clean energy." Clearly, the temptation to redistribute the "special deductions, credits, and other tax preferences," rather than ending them, remains strong. 2) As you look more closely at the revenue raisers, many of them fall into a few broad categories. The first three items, for example, have to do with corporations that have international operations. For a quick overview of what the specific proposals mean, you can check the explanations in the budget document. Here, I'll juse make the point that the U.S. is unique among the major economies in that it claims the right to tax the profits of U.S. corporations wherever in the world they are earned. Other countries only tax profits earned within their borders. Of course, this is one reason why U.S. companies sometimes seek to merge with a foreign firm and transfer their official ownership abroad. A foreign-controlled domestic company in the United States is taxed only on its U.S. profits; in contrast, if a company with the same structure is a U.S.-controlled firm, then the U.S. government claims the right to tax its foreign profits as well. This is a real issue for US corporate tax reform in a globalizing economy, and the approach in this budget document bascially just doubles down on going after revenue from abroad. 3) Some of the proposals here seem to be ideas whose time may have come. For example, the LIFO method of accounting for inventories refers to a last-in-first-out approach. Imagine a manufacutring company that buys a set of physically identical inputs over time, but the price of those inputs rises and falls. Thus, when the company pulls an item out of inventory and uses it, should it count as the cost the more recent purchase price, or an older purchase price (say, the FIFO or first-in-first-out method). There are reasonable arguments and well-established accounting rules for letting firms use LIFO and FIFO smooth out their expenses on fluctuating input prices over time. That said, corporations do use these tools to reduce their taxes. The International Financial Reporting Standards (IFRS) do not allow LIFO, which means that many international firms have already changed. In a globalizing economy, this seems like change worth making. 4) As the budget document notes, the Obama administration also proposed a one-time tax on the previously untaxed foreign income, which the budget estimates would raise $56 billion in 2017. As is well-known, U.S. corporations are holding something close to $2 trillion in profits they have earned abroad outside the United States, in part because they would have to pay taxes on those funds if they bring them back to the U.S., and so they keep some flexibility for making future foriegn investments if they wait before repatriating the funds. The budget proposes spending these one-time funds on transportation infrastructure. Again, this proposal assumes that the U.S. government should continue being the only country that seek to tax corporate profits wherever they are earned in the world, not just in the U.S. For those interested in reforming the corporate tax code, it will not feel "revenue-neutral" that the budget is proposing a net of $18.9 billion as tradeoffs for reforming the corporate income tax, while proposing that more than three times as much be taken out of the corporate tax system and spent on transportation. 5) Those who study business income in the U.S know that 90% of all U.S. businesses, now representing about one-third of all business income--and rising--do not fall under the corporate income tax. They are individual proprietorships or so-called S-corporations that instead are taxed under the individual income tax. Tinkering with the corporate income tax does not address this issue of businesses that are finding ways to organize themselves so that they are outside the traditional corporate income tax. For many economists, an important concern is that goal corporate income can often be taxed twice: for example, when a firm pays taxes on profits, and then distributes some of those profits as dividends that are taxed under the individual income tax. The true challenge of corporate tax reform is both to make sure that corporate income is taxed, so that corporations don't function as a huge tax shelter, but also to assure that corporate income is taxed only once, so there is no bias created against the corporate organizational form. President Obama has put forward one vision of corporate tax reform as far back as 2012, and other proposals are floating around. But judging from how the issue is laid out in this year's budget, a revenue-neutral simplification that resolves the international issues and addresses issues of alternative corporate forms like S-corporations is going to be hard to find.